Minutes from the Oro-beach and a large neighbourhood park is 22 Howard Drive, a family-friendly home on almost half an acre. At 2,799 square feet of finished living space, this home provides a perfect place for every member of your family to call their own. From the road, a charming front porch greets you, conjuring up images of sitting on an easy chair enjoying your children riding bikes in the quiet street. An open-concept living and dining room at the front of the home provides a great space to entertain. Garden doors in the dining room open up to provide access to a glassed in porch to expand the space and let the outdoors in. At the centre of the home is a large, renovated eat-in kitchen with an abundance of cabinet space. With a breakfast bar and a walkout to the back deck, there are endless dining options all within arms reach. 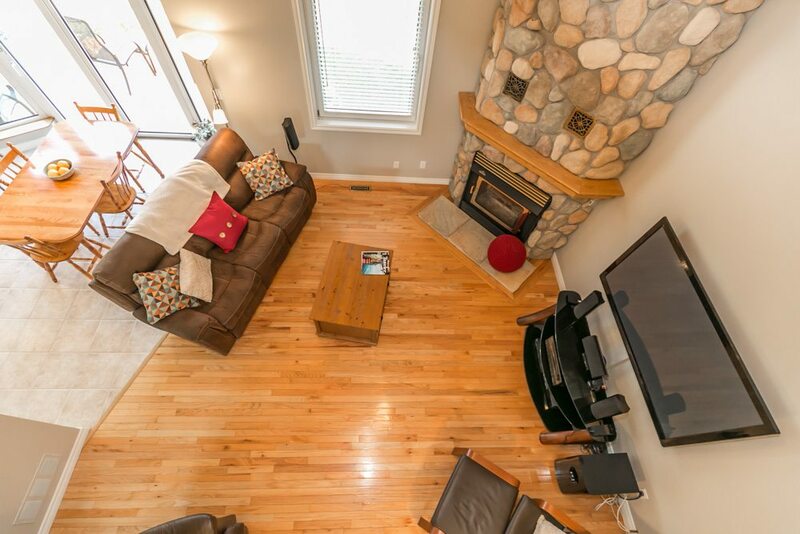 Off of the kitchen is an airy family room with cathedral ceilings and a wood burning fireplace for cozy winter nights. An office on the main floor is perfect for working from home or could be great space for children’s homework. The powder room, main floor laundry and mudroom provide amazing functionality to the main level. Upstairs, enjoy the spa-like getaway in your master suite, complete with an expansive walk-in closet and a fully renovated ensuite. With his and her sinks, a jacuzzi tub and a separate shower, the cares of the day will just melt away. Three large, character-filled bedrooms add to this level, along with a light-filled 4-piece bathroom. Across the catwalk, overlooking the family room, is a door leading to a bonus room over the garage with amazing potential for development. This space, at approximately 400 square feet, would be perfect for family movie nights and sleepovers. The lower level is partially finished and would make an amazing in-law apartment or an escape for teenagers with a walk-up to the garage. A large cold cellar provides the perfect space for storage. This home is full of upgrades from the garage doors and eaves troughs (2016) to the ground source heating. The unique addition of a drive-through third garage provides the ideal storage place for a boat or as an insulated workshop. Come make your memories in Oro Station, whether it be by exploring the creek with the kids at the rear of the property or cuddling as a family around the fireplace.